They are going to be very, very BAD. It will be one of the BEST seasons in franchise history. Sound strange? It is. But that’s just part of the fun of being a Bobcats fan. You see, the organization has spent its entire eight year run in Charlotte “winging it” from one blunder to the next — hoping that the ship will right itself magically both on the court and off. No more hoping. This team has a plan. And a good one at that. Newly hired GM Rich Cho set expectations early with a ballsy Draft Day trade that sent out Stephen Jackson and returned potential building block Bismack Biyombo. 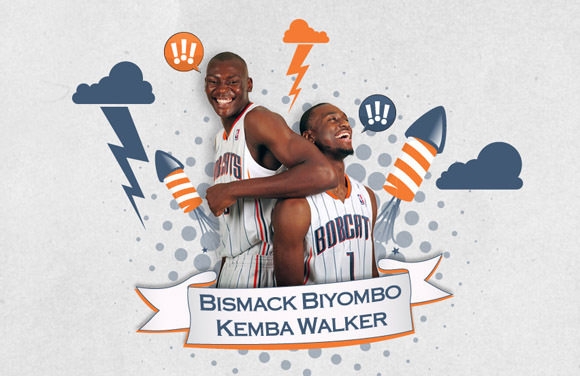 Kemba Walker came two picks later and now the team enters training camp with sights set not on this season but onward towards the summer of 2013. 1. Making the Playoffs = DISASTER. Cho has seen this movie before and he didn’t like the ending. REPEAT: You’ve got to be bad before being good. Being bad means a high lottery pick in a LOADED 2012 Draft. Charlotte has little chance of landing a superstar via free agency so the ONLY WAY that they’ll get one is in the draft. With Anthony Davis, Harrison Barnes, Andre Drummond, Perry Jones and Jared Sullinger just seven months away from shaking the Commissioner’s hand, the Bobcats MUST bottom out this season in order to have a shot at Lottery love. To make matters worse, if the ‘Cats somehow finish outside the top fourteen, their pick goes to Chicago as late payback for Tyrus Thomas. BOTTOM LINE: Be Entertaining But Do Not Win Games; expect a losing record. 2. Cheap, Young, No-Name Free Agents. At $49.7 million in guaranteed contracts, the Bobcats are already at the mandated 85% salary cap floor level. There is NO REASON to spend money on name-brand Free Agents this December. Here’s an exercise: Every time you see a commenter whining about how the Bobcats should sign Jamal Crawford, your immediate response should be laughter, followed by an immediate heaving sob when you remember that the team owes a combined $54 million to Corey Maggette, Boris Diaw, Gana Diop, Matt Carroll and “Don Juan Draper” Najera over the next two seasons. BOTTOM LINE: Expect the Bobcats to make a run at a young, cheap free agent over the next few weeks. 3. What Cap Space Means to Small Market Teams. Let’s be honest: Cap space for the Knicks and cap space for the Bobcats are two entirely different beasts. You’re never going to read a HoopsHype headline screaming: “Derrick Rose demands Sign and Trade to Milwaukee”. It just doesn’t work that way. Disgruntled Superstars want brighter lights, bigger cities. The only chance small market teams have in a star driven league is to draft homegrown talent, build a championship caliber nucleus around him and pay him gloriously. In the meantime, small market clubs like Charlotte can utilize their cap space by taking on bad contracts in exchange for draft choices or maintaining flexibility in the case a not quite-Superstar is available in a trade. Charlotte will be around $17 million under the cap next summer and nearly $40 million under the cap in the summer of 2013. By maintaining flexibility, the ‘Cats will in prime position should a team dangle picks or an All-Star over the next few seasons. BOTTOM LINE: Expect the Bobcats to be in the market for a salary dump-for-draft picks deal by the trade deadline. 4. Don’t amnesty Gana Diop. The amnesty “waiver” clause is a slap in the face to well-managed small market franchises. The “amnestied” contracts still have to be paid out, they just don’t count against a team’s cap — which means free spending teams like the Lakers, Wizards, Magic, Mavericks and Knicks essentially get a higher cap than the rest of the league. Don’t get me wrong, Gana Diop and his albatross full-midlevel deal has been an unmitigated disaster, a final “F.U.” from Larry Brown, but if you have to pay the guy anyway why not try and get something out of him. Even if its only one point, one block and two and a half rebounds in eleven minutes. The Bobcats aren’t going to need the cap space for the next two years anyway and having Diop’s contract on the roster will help* them reach the 85% cap threshold in the meantime. BOTTOM LINE: Don’t expect the Bobcats to waive Gana Diop this season. 5. Re-Sign Kwame Brown ONLY if the money is right. Kwame was a great redemption story last season. He played hard and kept the team in games with his rugged low post defense and surprising collection of double-doubles. The issue is that at 29, Brown is just a little too long in the tooth for the Bobcats plans. If he’s looking for more than $4 million per, then the team should let him walk. There is one other option: If the team is in love with him and wants to secure his services for another three or four seasons, they could throw him a “Nick Collison” deal by handing him $8 million this season and $3.5 over the next three. This would give Kwame a 4 year $20 million deal without jeopardizing future cap flexibility in the summers ahead. BOTTOM LINE: Expect the Bobcats to re-sign Kwame ONLY if they can fit him into their long-term salary cap plans. 6. What to do with Boris Diaw? It’s the final year of his contract and you would hope that he’ll be motivated to earn one last big payday. If so, then great. The Bobcats would like nothing more than for Diaw to come in, play hard and catch the eye of a contender in need of frontcourt help. A badass Boris could mean another draft pick or prospect via trade while an average one will at least mean cap relief come July. BOTTOM LINE: With Bismack, Tyrus and D.J. White already at the PF spot, Diaw could be the first Bobcat traded this season. Adam Morrison is making a comeback. Sure, we’ve all seen that ridiculous scrap AMMO picked with an 18 year old kid in Serbia but did you see the sick highlight reel where he dropped 30 in old-school Gonzaga-mode just a few games later? Morrison is angling for a return to the league and I can’t think of any better team to do it with than the one that drafted him five years ago. The ‘Cats needs another scorer off the bench, needs depth at the SF position and Morrison will no doubt come cheap. It worked with Kwame, why not try it with the ‘Stache? BOTTOM LINE: I can’t think of a better storyline for the Bobcats this year than to have Adam Morrison come back and average double figures off the bench. It’s worth a shot. Here’s a crazy thought to chew on: Brandon Roy is going to get amnestied soon. Although there’s massive risk involved, he won’t cost much (no more than $5-$7 million), and it’s not as if he’d be wrecking a potential playoff team. If he’s a success, he’s the first superstar in Bobcats history–making up for the Morrison blunder–or even an upgrade over Henderson for the next four years. At worst, Charlotte ate up a solid chuck of their cap in a season they were going nowhere anyways. 1. Brandon Roy’s days of being an All-Star are likely over. 2. Spending $5-$7 million for a role player is how the Bobcats got into this mess to begin with. You could make the argument that with his knee issues, Roy may have a less rosy future than AMMO. I’m sure someone will pay Roy once he’s amnestied but I highly doubt it will be the Bobcats. Just doesn’t fit the long-term plan. Totally agree with the other Ben. Roy should be given a chance just to see what exactly he has left in the tank. My one fear is that, if he does succeed and excel as a Bobcat, that Bobcats Nation could become attached to him so that when it comes time to potentially re-up his contract, the fan base will be rabid to resign him. His knee is not about to get better. The bone-on-bone action is just going to get worse. It is just an endurance game to see how long he can live with it. I just don’t want to set myself for future heartache. Incredibly good article…I actually agree with everything (including the AMMO deal). I’ve talked a lot about signing Kwame Brown to a front-loaded contract (ala Collison and Millsap). As you mentioned, a $20M/4Years deal paid $8M/Yr1, $4M/Yrs2-4 or a $15M/3Years paid $8M/Yr1, $3.5M/Yrs2-3 will be a great pick for the Cats and a good offer for Kwame. I truly doubt he’ll get more than $5M/Year (On Average), which is equal to the full MLE. I hope we go after Dalembert. That would get us the 8th seed. Well you’ve gotten everything right so far… except for that Adam Morrison thing but I had a feeling you were kind of joking about that one.